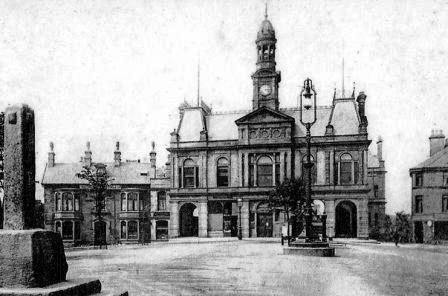 Buxton Town Hall was designed by William Pollard and opened in 1889, replacing the Market Hall which had been destroyed by fire some years earlier. The front of the Town Hall faces on to the Market Place and the rear of the building leads out to 'The Slopes', where the official town War Memorial is located. 'The Slopes' was finally chosen as the location for the Memorial as it overlooks the main features of the town and can itself be seen from the Town Centre. 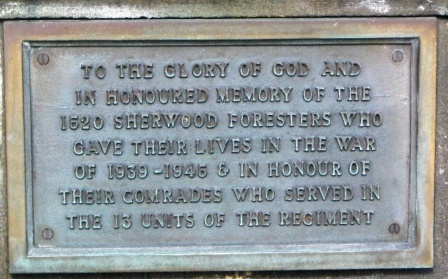 Located on the front wall of the Town Hall, facing the Market Place are two small Memorial Plaques dedicated to the memory of the fallen of the Sherwood Foresters Regiment in the two World Wars. The first commemorates the 11,409 men of the Sherwood Foresters who gave their lives in the First World War, whilst the second is dedicated to the memory of the 1520 men of the Regiment who died in the Second World War. 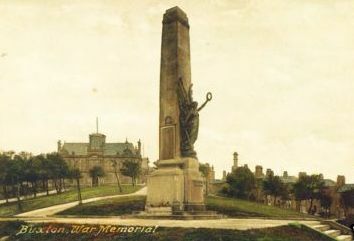 The photograph on the left - taken from an original postcard from the 1920s - shows Buxton's "The Slopes" War Memorial, not long after it was unveiled on the 18th September 1920. Since then a surrounding wall and paved assembly area has been added, no doubt to enable the Annual Remembrance Day Service to take place. In the background is the rear of the Town Hall. 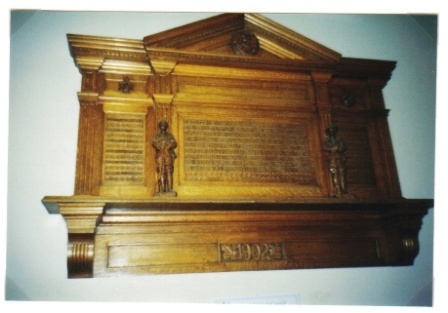 This Memorial commemorates the 15 men from the town who served in the Boer War [South African War] and in particular Sergeant W. H. Perkins, Derbyshire Regiment, who was killed in action at Rhenoster River, 7 June 1900 (Battle of Roodeval). Also named on this Memorial is Corporal (later) Sgt. William Chamberlain PERKIN, who re-enlisted in Canada and died on the 18th May 1915, serving with Princess Patricia's Canadian Light Infantry. Canadian Archives show that William "Died of wounds - Gunshot wound, leg amputated at No. 3 General Hospital" on the 18th May 1915. He is buried at Le Treport. "On Crich Hill a Monument is erected in Memory of 11,409 of all ranks of the Sherwood Foresters (Notts and Derbyshire) Regiment who gave their lives for King and Country in the Great War 1914 - 1919 whose names are recorded with gratitude and love in Books of Remembrance deposited in Nottingham and Derby and also in honour of all their comrades who gloriously served in 32 Battalions of the same Regiment to the number of 140,000"
N.B. 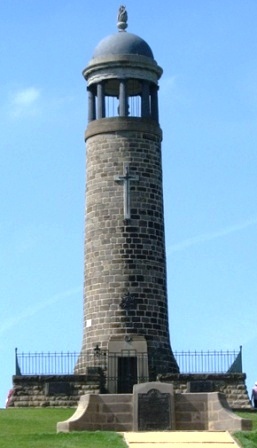 The lighthouse tower at Crich, Derbyshire, was built in 1923 to commemorate the First War dead and in 1952 it was further dedicated to the memory of the 1520 men of the Regiment who died in the Second World War. 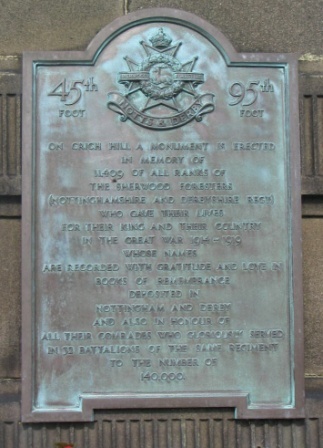 In 1991 the Memorial was dedicated again to memory of the Sherwood Foresters killed in service 1945 - 1970 and those of the present Regiment who have given their lives in Service to this country. As well as the main tower the site also contains three individual Memorials, including one to General Sir Horace L Smith-Dorrien, GCB. GCMG. DSO., Colonel of The Sherwood Foresters from 1905 until his death on the 12th August 1930. As Commander of 'D' Corps of the British Expeditionary Force, and contrary to orders, he took the decision to stand and fight at Le Cateau on the 26th August 1914 during the retreat from Mons and in so doing probably saved the BEF from destruction by the advancing German forces. Conan Doyle described the action, but left out the number of prisoners taken (420). "Two miles beyond Roodeval station there is a well-marked kopje by the railway line, with other hills some distance to the right and the left. A militia regiment, the 4th Derbyshire, had been sent up to occupy this post. There were rumours of Boers on the line, and Major Haig, who with one thousand details of various regiments commanded at railhead, had been attacked on June 6th but had beaten off his assailants. De Wet, acting sometimes in company with, and sometimes independently of, his lieutenant Nel, passed down the line looking fur some easier prey, and on the night of June 7th came upon the militia regiment, which was encamped in a position which could be completely commanded by artillery. It is not true that they had neglected to occupy the kopje under which they lay, for two companies had been posted upon it. But there seems to have been no thought of imminent danger, and the regiment had pitched its tents and gone very comfortably to sleep without a thought of the gentleman in the tinted glasses. In the middle of the night he was upon them with a hissing sleet of bullets. At the first dawn the guns opened and the shells began to burst among them. It was a horrible ordeal for raw troops. The men were miners and agricultural labourers, who had never seen more bloodshed than a cut finger in their lives. They had been four months in the country, but their life had been a picnic, as the luxury of their baggage shows. Now in an instant the picnic was ended, and in the grey cold dawn war was upon them--grim war with the whine of bullets, the screams of pain, the crash of shell, the horrible rending and riving of body and limb. In desperate straits, which would have tried the oldest soldiers, the brave miners did well. They never from the beginning had a chance save to show how gamely they could take punishment, but that at least they did. Bullets were coming from all sides at once and yet no enemy was visible. They lined one side of the embankment, and they were shot in the back. They lined the other, and were again shot in the back. Baird-Douglas, the Colonel, vowed to shoot the man who should raise the white flag, and he fell dead himself before he saw the hated emblem. But it had to come. 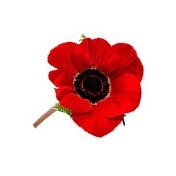 A hundred and forty of the men were down, many of them suffering from the horrible wounds which shell inflicts. The place was a shambles. Then the flag went up and the Boers at last became visible. Outnumbered, outgeneralled, and without guns, there is no shadow of stain upon the good name of the one militia regiment which was ever seriously engaged during the war. Their position was hopeless from the first, and they came out of it with death, mutilation, and honour."